When talking about network performance products, Netgear is a name that always springs to mind because of their consistent quality and customer satisfaction ratings. 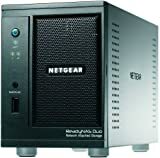 The Netgear ReadyNAS Duo has all the punch of a standard NAS device, and then some. And because it’s produced by Netgear, you can rest assured that what you’re getting is worthwhile and perfect for all of your needs. With software built into the ReadyNAS, all of the music files you have stored on the device can be streamed via your wireless router to your Logitech Squeezebox, a wireless music player. The beauty of this service is that you can use your squeezebox anywhere in the house without having to have your loud and energy inefficient desktop on to stream music files to the device. It’s all well and good if a company advertises that their NAS device or hardware is capable of RAID backups, but if it doesn’t deliver the safety it guarantees, your data will be lost forever. Word on the street is (luckily we never experienced a hard drive failure within the device!) that the RAID backups on the ReadyNAS are top notch and we haven’t yet found any cases of data loss through the RAID malfunctioning. That means good news for your precious information! While the device comes with 2 drive bays standard, which you can use for up to 4TB of storage (2x2TB internal storage), the Netgear comes with 3 USB ports on the outside of the device, making it possible to add even more storage to your device if your internal storage fills up. Now, you obviously won’t be able to use RAID with your external drives, but if you’re trying to add a place for music and movie files to be stored, or other not so important files, external hard drives are a great idea. Another amazing feature of the ReadyNAS is its web server capabilities. If your home internet speed is up to the challenge, you can configure the Netgear device to be able to dish out web pages online to save costs on web hosting bills each month. We never ran into any operational issues while we were using this device. It was quiet and problem free since taking it out of the box. The only complaint we have with it, and other users have said the same thing, is that this device is definitely geared to a more technical audience To utilize the ReadyNAS’s full potential, you’ll have to wade through some fairly tech-heavy jargon in the user manuals. If you’re OK to learn what everything means, you can have a full web server running in your living room. If that’s not your thing, the ReadyNAS is easy to set up and install drives into if you’re just looking for a home solution to back up your files. We’d recommend this product in a heartbeat for its reliability and 3 year warranty in case anything goes wrong down the line.